This is PARC chair Takaichi Sanae at her happiest. Really. It is unsurprising that the moderately crazies in the LDP, particularly the hardliners in the freshmen classes of 2012 and 2013, would be clamoring for a party response to the Asahi admissions of error. The extreme revisionists contention has been that the comfort women are a fiction concocted by The Asahi Shimbun and anti-Japan non-government organizations in South Korea. The Asahi's long overdue retractions would, in their eyes, require a government response, as a remorseful Statement like Kono's may indeed no longer be necessary. What is somewhat surprising is how quickly and avidly PARC Chair Takaichi Sanae has taken up the banner of a demand for a new Statement. Takaichi is considered a shoo-in for a significant Cabinet post in the upcoming Cabinet reshuffle (Link). She has a long record of being a loyal retainer to Prime Minister Abe Shinzo (she was the most junior minister of his first Cabinet in 2006-7; she sat next to him during the LDP party meeting where Abe was elected party president in 2012), is a True Conservative (she is always in front and center of the phalanxes of Diet members of the "Let's Visit Yasukuni Together" league on their shrine visits - see above) and a prominent female member of the LDP at a time the PM wants to make a show of appointing women to the Cabinet (Link). Securing a Cabinet post at this point would seemingly require her to sit tight, make no trouble and have the prize drop in her lap. So why embrace a movement demanding a change in a fundamental building block of Japan's relationship with South Korea at a time when the prime minister and his advisors are trying to bridge the gap between the two countries? One that furthermore puts an onus on Chief Cabinet Secretary Suga to craft a new Statement when he has way too much on his plate already? If one wanted to mess up a potential Cabinet appointment, making Suga Yoshihide's life difficult would seem a great way to do it. One explanation for Takaichi's enthusiasm, and the reason I use the "somewhat" above, is that she is probably tone deaf when it comes to what she believes are matters of Japan's dignity. 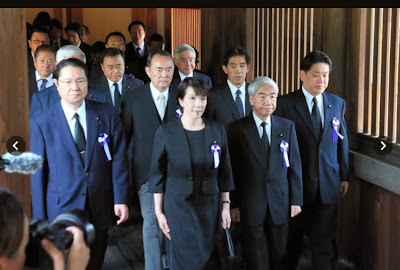 She has her own small group of lawmakers -- the Association of Creativity and Tradition -- that brings together lawmakers who style themselves innovative iconoclasts with a fantabulist, knee-jerk defensiveness about pre-1945 Japan. The cognitive dissonance of the ideals -- believing at once in the value of disruption and the beauty of traditional order, as is reflected in the group's name -- indicates that in matters pertaining to the constructed concept "Japan" Takaichi-san may not be prone to deep thought. Another possibility for Takaichi's unshaded embrace may come from a gnawing sense of her having achieved very little in her present position. Despite Takaichi being one of the longest-serving PARC chairs, even close watchers of politics would be hard pressed to think of a single, significant initiative she led during her tenure. Policy making under Abe 2.0 has been almost entirely in the hands of the bewildering forest of commissions, councils and private advisors reporting directly to the prime minister. Movement of legislation through the PARC has been largely a pro forma affair. When political observers think of Takaichi at all, it is for her skirmishes with General Council chair Noda Seiko, diminishing the power and value of both of the institutions they have headed. 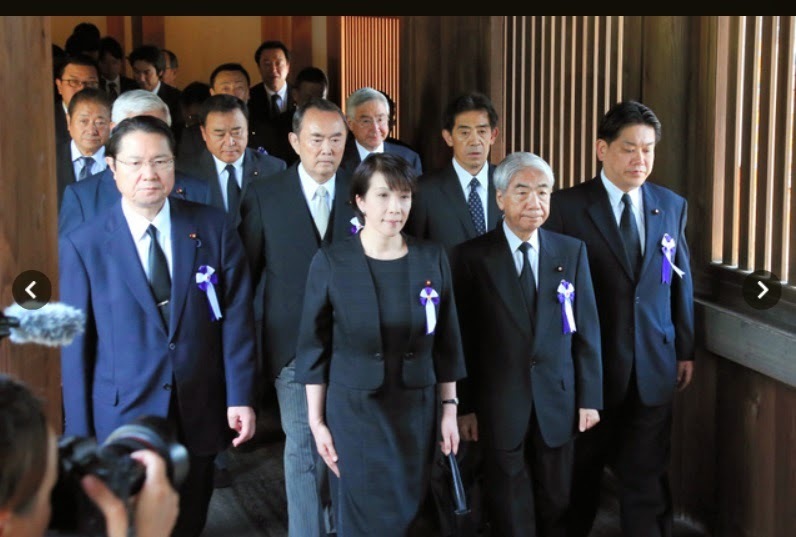 In forwarding the PARC's request for a new Chief Cabinet Secretary's Statement to Suga, Takaichi can claim at least one signatory achievement during her tenure, one endearing her to radical, unthinking revisionists -- her only constituency within the party. Assuming that the PARC's request is forwarded to Suga early next week as scheduled, what happens? As a direct request from the party, Suga cannot reject the request as unhelpful, no matter that it is. He could shelve the request for a while but not indefinitely. The request is for a new Statement in time for the August 15, 2015 anniversary -- which means at some point Suga will have to come out with a clear position on the question of whether he will provide a new Statement or not. The most likely scenario is Suga turning down the request on the grounds that it would detract from the prime minister's new, "forward-looking" Statement on the end of the World War II which the PM hopes will replace the Murayama Statement as the definitive Japanese government view of the war. Until Suga moves decisively against the PARC's request, his inaction will be read or portrayed by South Koreans as a prelude to a revision of the Kono Statement and thus one more reason to delay the reestablishment of more normal relations between the governments of Japan and the ROK.